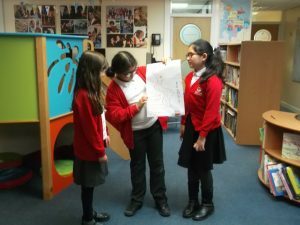 This afternoon, four of the Fairtrade Council, Hala, Susan. 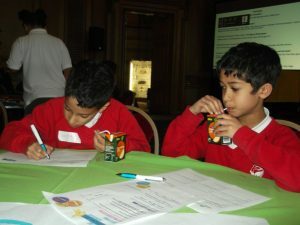 Haroon and Nathan attended the Fairtrade Celebration at Leeds Civic Hall. 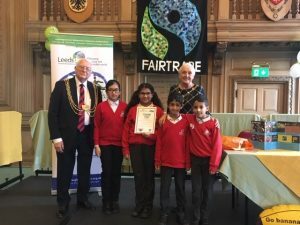 The event was organised by Leeds DEC with Fabian Hamilton MP opening the event and speakers from the Co-op and Divine Chocolate. 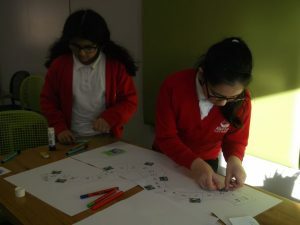 The ambassadors thoroughly enjoyed delivering their workshop and attending other ones not to mention sampling some Fairtrade chocolate cutousey of Devine Chocolate. 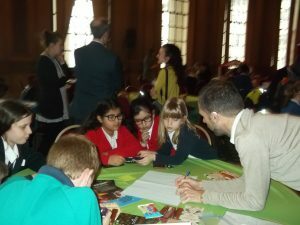 The Lord Mayor and Mayoress were also in attendance and the children were really excited to be able to meet them. 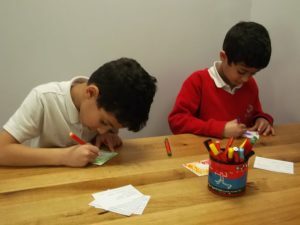 All in all it was a most enjoyable afternoon. 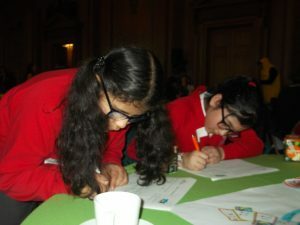 Later today Hala, Susan, Haroon and Nathan will be attending the Fairtrade Celebration at Leeds Civic Hall. 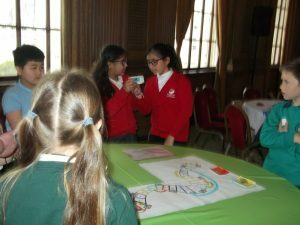 The ambassadors are really excited to be attending, representing school and sharing their board game that they have created with other children. 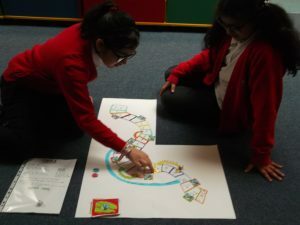 Susan and Hala decide to have a quick game at breaktime to make sure that it all works. 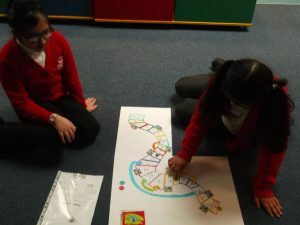 This week Hala, Susan, Haroon and Nathan have been working really hard, meeting up at breaktimes to design and put the finishing touches to the board game that they have created to take to the Fairtrade Celebration at Leeds Civic Hall on 1st March. 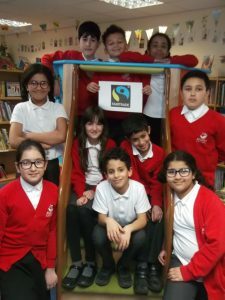 This afternoon this year’s Fairtrade ambassadors met to talk about Fairtrade and how we can help and raise greater awareness in school. 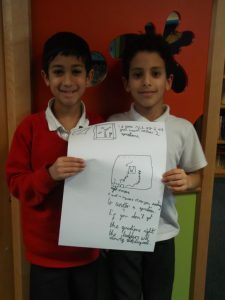 The ambassadors suggested that a newsletter/magazine could be created with articles, interviews, quizzes and wordsearches. 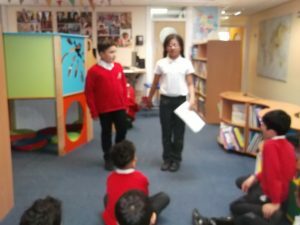 Miss Whiteley and Mrs Walker also talked to the ambassadors about the impending visit to the Fairtrade Celebration on 1st March where four of them would attend and deliver a workshop to groups of other Primary and Secondary school children. 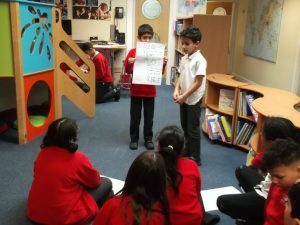 Working in pairs the ambassadors cam up with some wonderful ideas for the workshop which they then presented to the rest of the council. 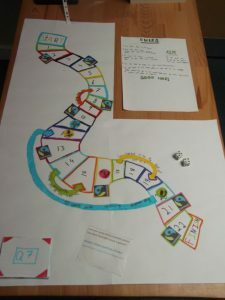 With great difficulty a board game idea was chosen with elements from two groups selected. 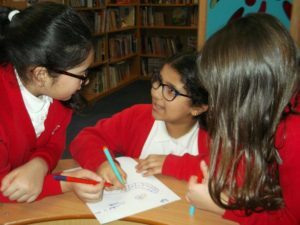 Fairtrade Fortnight will be taking place from 25th March until 10th March. 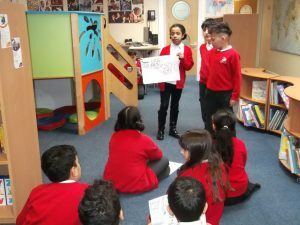 It is a time when schools and other groups come together to learn about Fairtrade and what it is and how we can help. 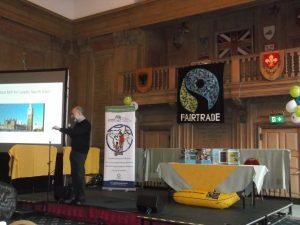 The focus during Fairtrade Fortnight will be on cocoa. 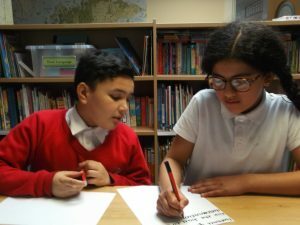 Prices of cocoa have dramatically fallen over the last few years and this is making life really difficult for cocoa farmers especially in West Africa where most cocoa is grown.